Volume Converter is an application that lets you convert between US, imperial and metric volume units. 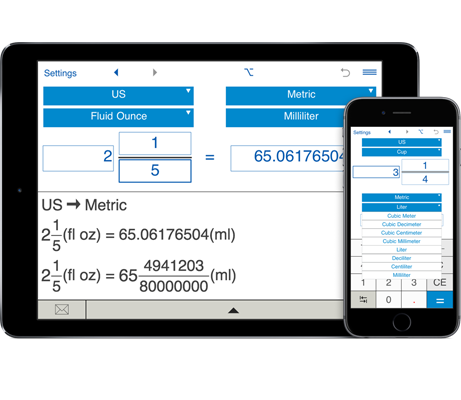 You can use the volume converter to convert between US, imperial and metric volume units. For example, you could convert from fluid ounces to milliliter, from сubic meters to cubic feet, etc. US volume units: US liquid gallon, US liquid quart, US liquid pint, US cup, US gill, US fluid ounce, US tablespoon, US teaspoon, US fluid dram, cubic Foot, cubic Inch. Imperial volume units: imperial gallon, imperial quart, imperial pint, imperial cup, imperial gill, imperial fluid ounce, imperial tablespoon, imperial teaspoon, imperial drachm, imperial cubic foot, imperial cubic inch. Metric volume units: сubic meter, сubic decimeter, сubic centimeter, сubic millimeter, liter, deciliter, centiliter, milliliter.